We celebrated my son's 6th birthday today. As you can see, it was a pirate theme. My wife, sister, and brother built the boat in the picture below out of cardboard and wood. 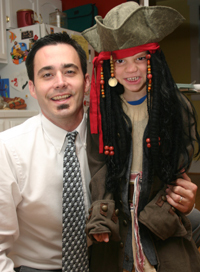 The kids had fun and have been playing pirate all weekend with the pirate party favors. 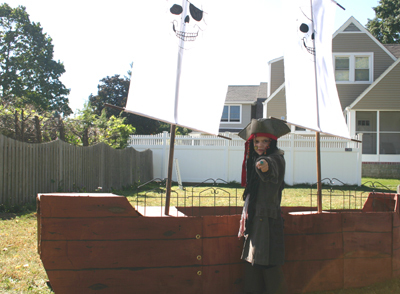 The pirate ship came out awesome. Ye look like a fierce pirate but who be that blimy bloke next to ye with the spotted noose round his neck? Argh..make'im walk the plank next time you see him! I'm glad the kids had a good time, it was so fun to plan for.